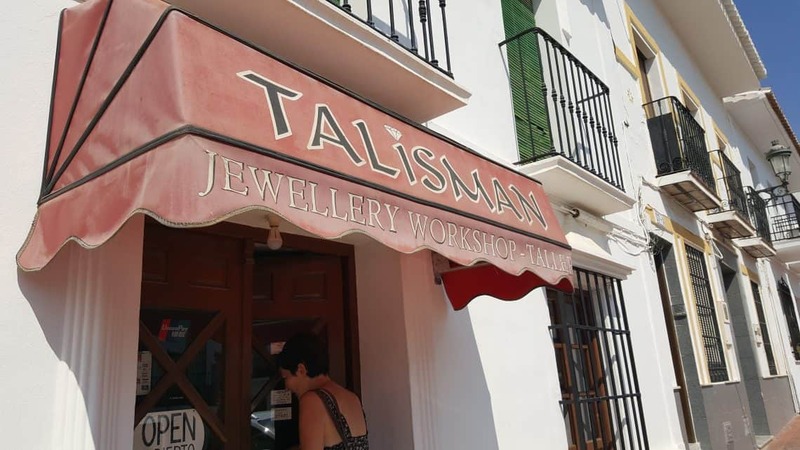 We found Talisman Silversmiths in the wonderfully sleepy village of Maro, Spain. You need to drive about forty five miles east of Malaga. Maro sits on the edge of a cliff, overlooking the sea and as you will see is surrounded by agricultural land. We think it’s beauty is beyond words. The village was recently featured on Spanish TV programme and has since become popular with Spanish tourists. We find it can become busy on high season weekends. Consequently, we try to visit it during the week to catch it at its best. Talisman Silversmiths is located in the heart of the village. We love the appropriate background music and effective air conditioning. Entering, we found several large display cabinets containing virtually every conceivable type of silver jewellery. The owners are most welcoming and seem happy to chat to customers. In addition, the prices are realistic as well. As we move to the counter, you will see in the background the Talisman Silversmiths workshop. This contains some really impressive old silversmith metal fabricating machinery. Additionally, be sure to check out the tools in the workshop. There is a lifetime’s collection of hammers, files and miscellany necessary to the trade. As a result you may be sure your jewellery is made by experienced hands. We were struck by the difference between Talisman Silversmiths offerings and our own. This isn’t surprising though, most jewellery outlets have there own style and angle. Talisman appear to focus on sheet and wire fabrication. Here at Volant Silver we concentrate on silver casting. As a result our product offerings are very different.